I have a confession…the robe pictured here is actually a present for someone else! LOL – as you may know, my daughter’s name is not Harris. But when you have a neighbor who looooooooooves Minnie Mouse as much as this little girl loves Minnie Mouse, it feels good to do something special for her. Like get personalized-Disney-fabric-and-make-her-a-handmade-gift special. My daughter’s can always use new robes or towels, which made the quick and easy raglan kids robe pattern perfect to create. Due to generous sizing, this robe can fit anywhere from a big 2T, to a small 6 (my daughter is a very small 7 – as seen in these photos). The fact that it is made out of knit, makes it pretty forgivable to a variety of sizes, and perfect for growing girls and boys. 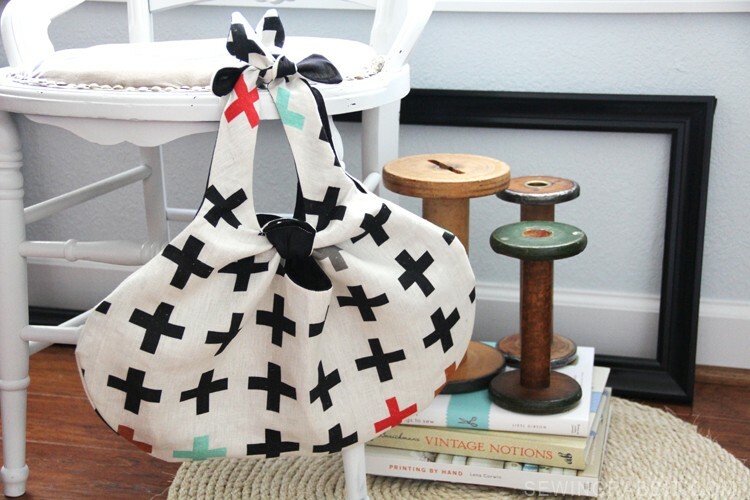 Be sure to check out the new custom fabric line available exclusively at Jo-Ann Fabric & Craft Stores? You can now personalize the fabric of your choice with names, monograms, or sayings to make the perfect custom fabric. Perfect for a unique bridal shower, baby shower, birthday, or home decor gift. The fabric is offered in fleece, knit, canvas, minky, or poplin. CLICK HERE to see them all! Print out pattern and tape pages together as indicated. Verify that the 2” test square is correct, and cut out pattern pieces. Fold belt loop pattern piece right sides together, matching up long side edges. Pin and sew. Turn loop right side out. Repeat for both belt loops. Fold sleeve right sides together, matching up the shorter outer edges. Pin and sew. Fold in half, matching up the outer raw edges, enclosing the seam. Repeat for both sleeves. Fold the belt loop in half, matching up the outer edges, creating a loop. Using the belt loop marking on the pattern, pin raw edges of belt loop to right side of back robe pattern piece. Baste stitch to secure. Repeat for both sides. Place front and back robe pattern pieces right sides together, matching up the shoulder and side seams. Pin and sew. Slip sleeve over the robe arm, matching up the side seam with the sleeve seam, with all raw edges touching. 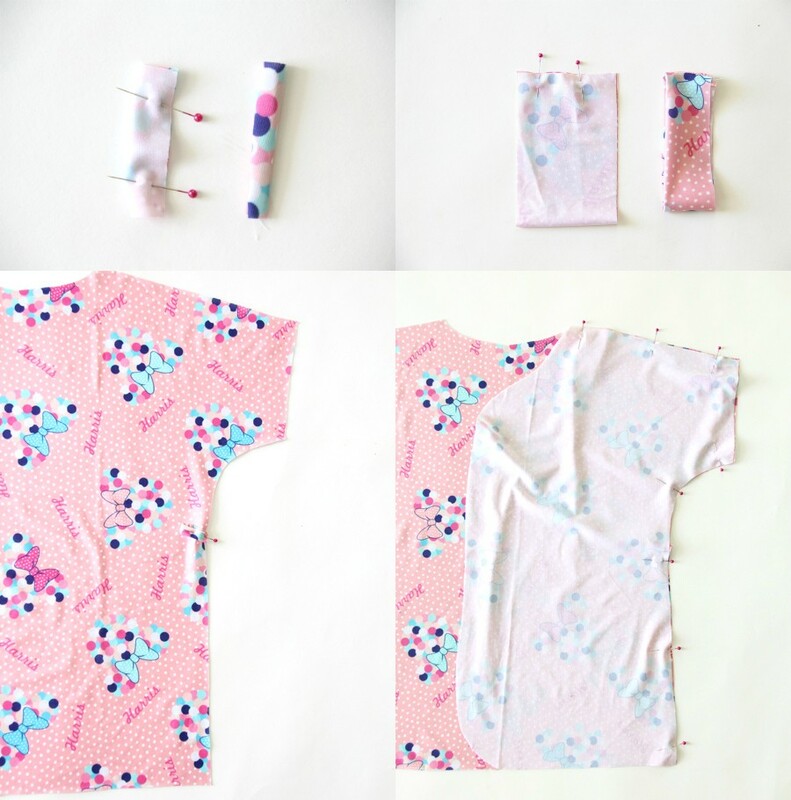 Pin around and sew, using a serger, zigzag, or stretch stitch. Press seam up (towards shoulder), and sew around using a long straight stitch. Repeat for both sleeves. Iron knit stay tape onto the wrong side of the entire outer edge of the robe. Fold outer edge towards the wrong side, enclosing the knit stay tape, and press. Sew around using a double needle, zigzag stitch, stretch stitch, or long straight stitch. Fold belt wrong sides together, matching up the long outer edge. Pin and sew. Turn belt tube right side out and press. Fold belt side edges ¼” towards the seam side, fold again ¼” and press. Sew to secure. Repeat for both sides. 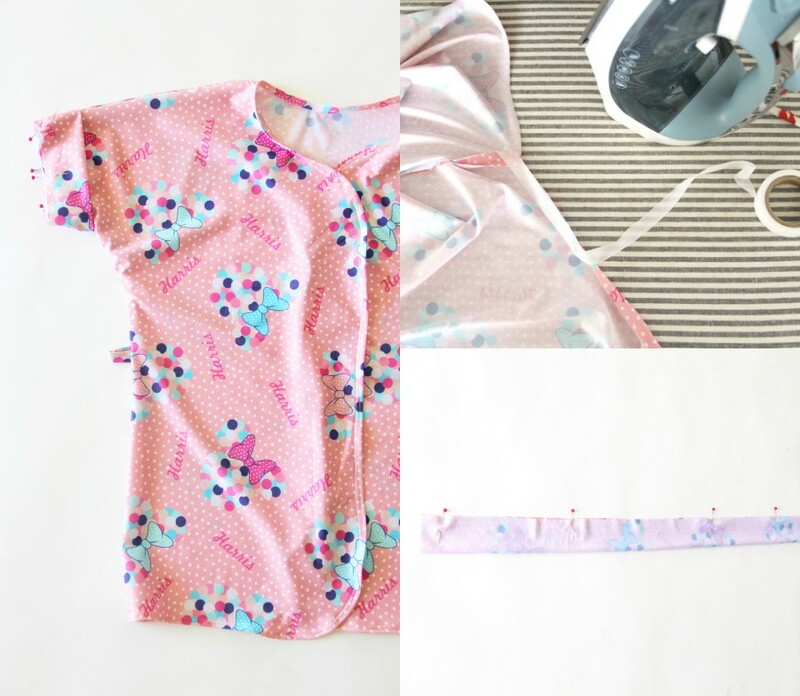 Slip belt through the belt loops, and you are done making the free kids robe pattern! Thank you for the pattern. Just sorted out all my fabric, and need patterns to sew. I think it’s adorable but I think naming it a rayon sleeve is misleading……this is really a dolman sleeve, not a rayon. Thank you for your generosity in making patterns available for free. Stupid auto correct. Raglan, not rayon. Oh my goodness, you are so correct!!! I can’t believe I missed that, total slip up. Thank you for correcting me, total brain fart there / lol!!! I have fixed it, thanks to your help. Thank you again, I still cannot believe I goofed like that. Duh. It’s really cute. I love dolman sleeves, and that plus the cuff at the end makes this one a little different from the other robe pattern out there.